I added some Americana touches in the media room. …..but I still kept enough pieces to decorate this room. 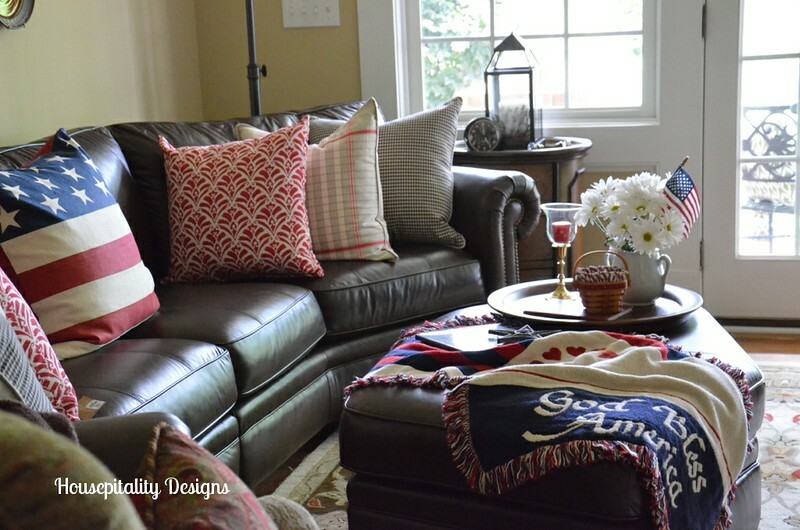 …..and the two red and white pillows that flank it are also from Pottery Barn (outdoor collection). Added a book and an antique iron star..
Added a vase of flowers, an antique Atlas (dated 1915), and a basket to the vignette. 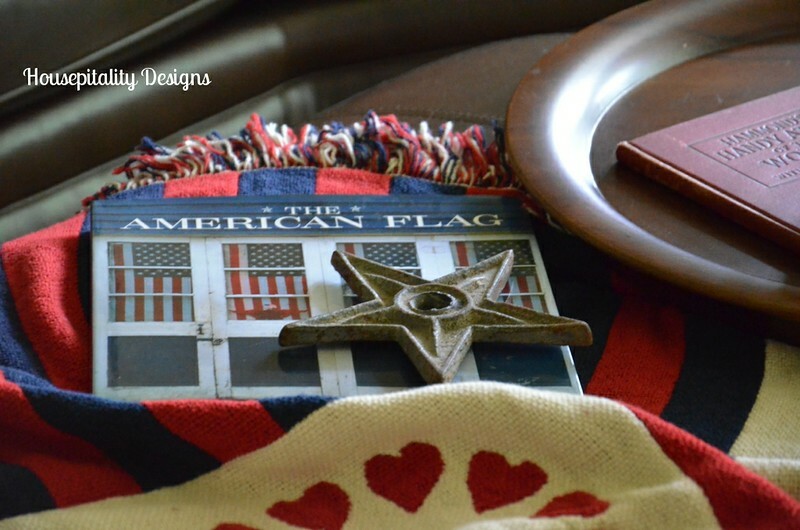 I have had this Americana/flag throw for many years. Not much “Americana” here, but had to show you the Big Ben clock I scored for $5.00..
…..why just $5.00??? because it does not work..but you can move the hands. I set it at 5 o’clock, as you know, it is always 5 o’clock somewhere! 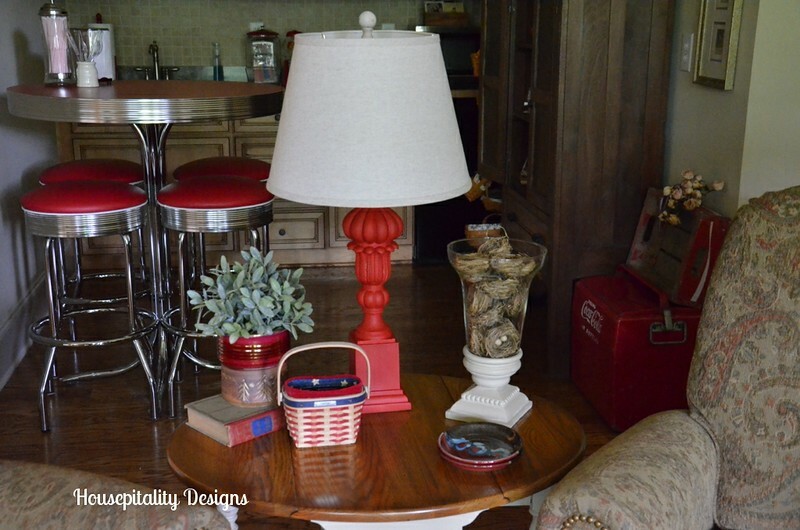 …..I painted the lamp red as I use red for one of my accent colors in the room. 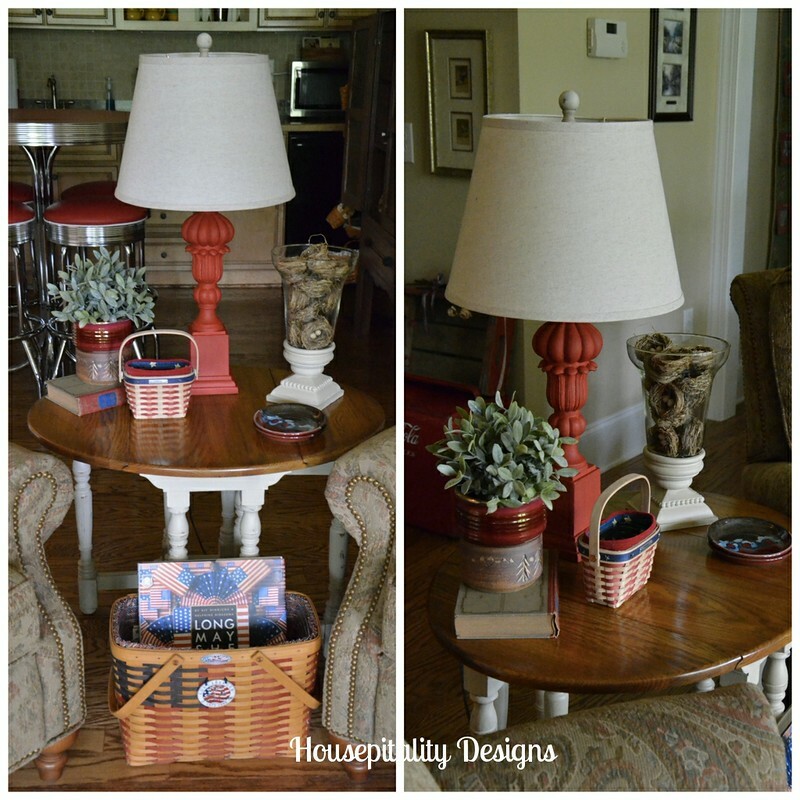 I used Annie Sloan Chalk Paint/Emperor’s Silk. 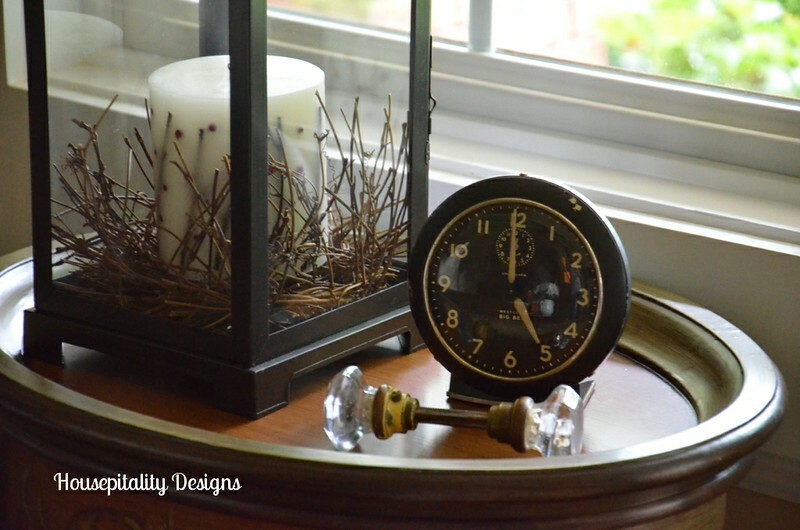 I am thinking that I may distress this lamp a bit with some antiquing wax and possibly add a burlap shade..
Today was very dreary…raining on and off…will be like this for at least a couple more days…. …..so I had to really make adjustments on my camera, as this room did not have much natural light today. I will be showing the dinette area of this room on Friday, as it will be a part of my Friday Series. 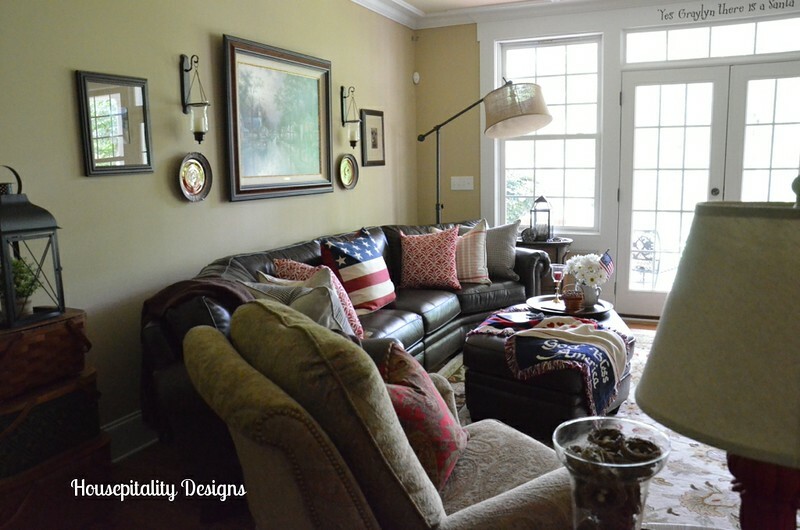 Across this seating area is the bookcases and TV…no Americana decor there..
You will see more of this room when I finally get around to updating my home tour..
….as my “home tour” is in dire need of being updated! I wish you all a very safe and wonderful 4th..enjoying the celebration of our nation’s Independence Day! I love it all, Shirley. I ordered the flag pillow. It won’t be here until after the 12th. I can use it for Labor Day and Veterans Day this Fall, even though I won’t be able to for the 4th. Very nice and patriotic, Shirley. I have even more seller’s remorse because I got rid of just about everything when we left Florida. Now I’ m replacing some things. Have a safe and happy Fourth! Angela’s recent post…Non-traditional July 4th!! 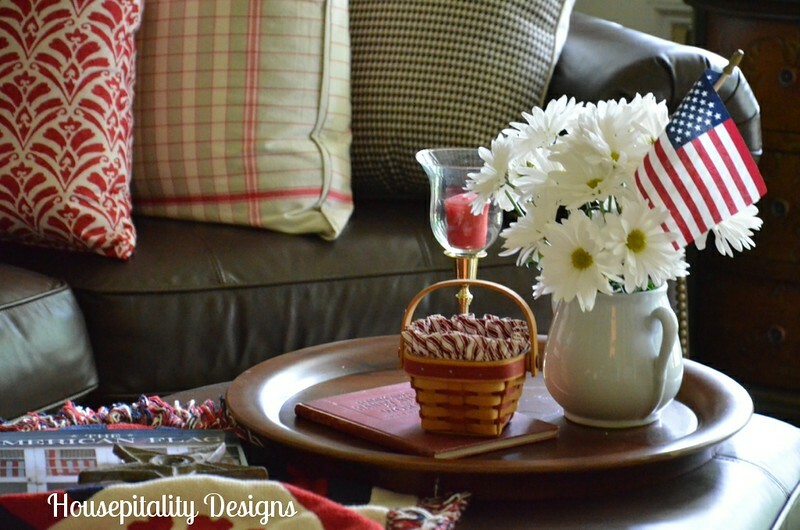 Love your patriotic touches! Have a happy & safe 4th! 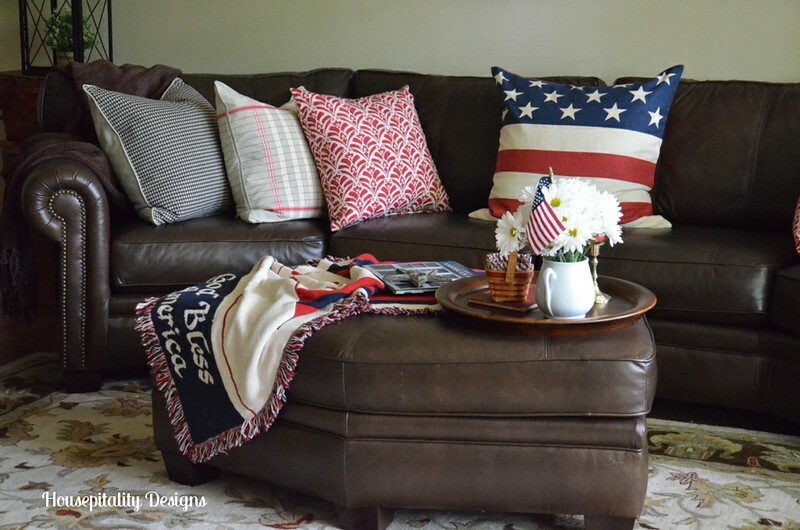 Shirley, your patriotic touches are just perfect in your media room! 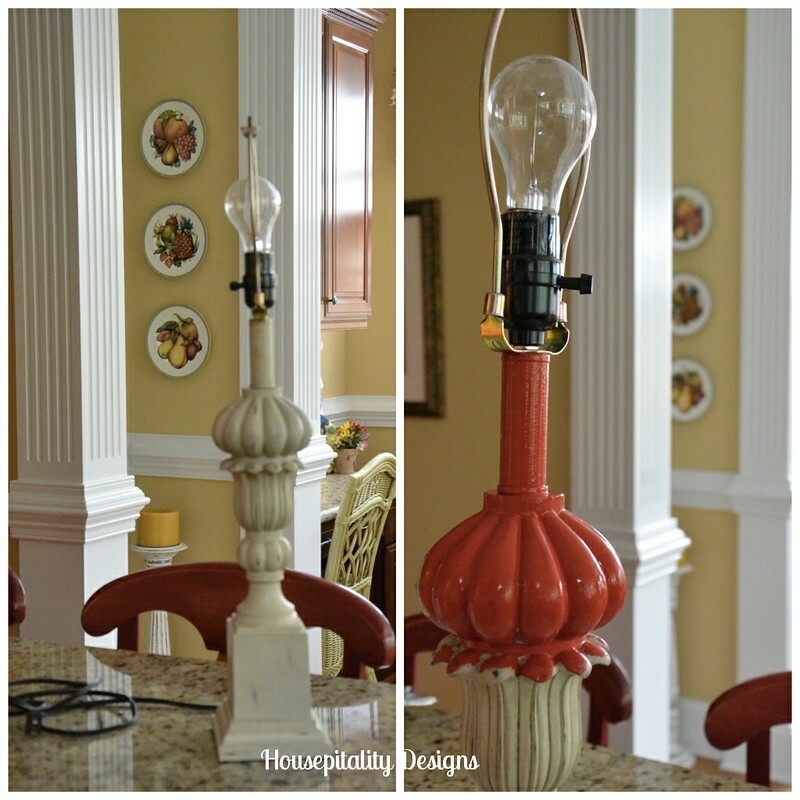 What a great idea to paint the lamp and add it! Your pillows and throw are wonderful! It looks like it’s time for a celebration! Happy Fourth of July! P.S. Has anyone said they have had trouble loading your page with the email subscription? I have had trouble on the last three posts. It may just be me, but I wanted to mention it. Nice touches and happy 4th! 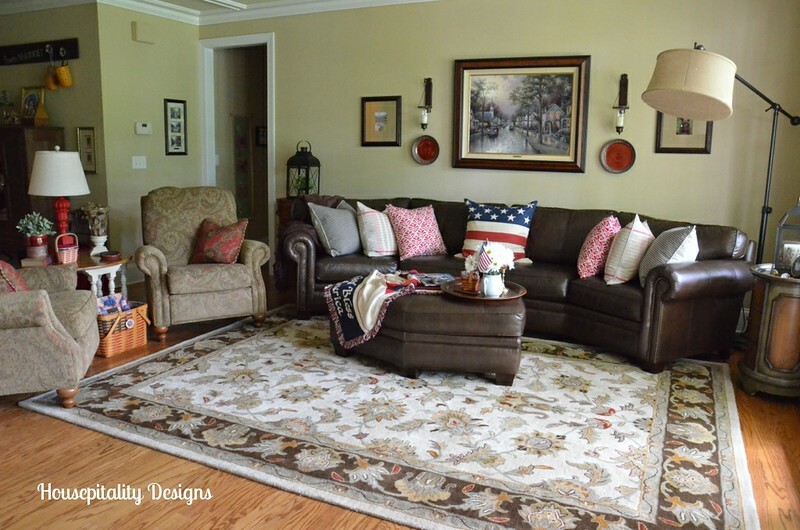 Love your patriotic touches Shirley! I just found Long May She Wave for a song and added it to my collection! I’m sooooo ready for some dry weather, we’re about to float away! Wishing you a Happy (and dry 🙂 Independence Day! Very pretty Shirley! Love that red lamp!! Your room looks great! 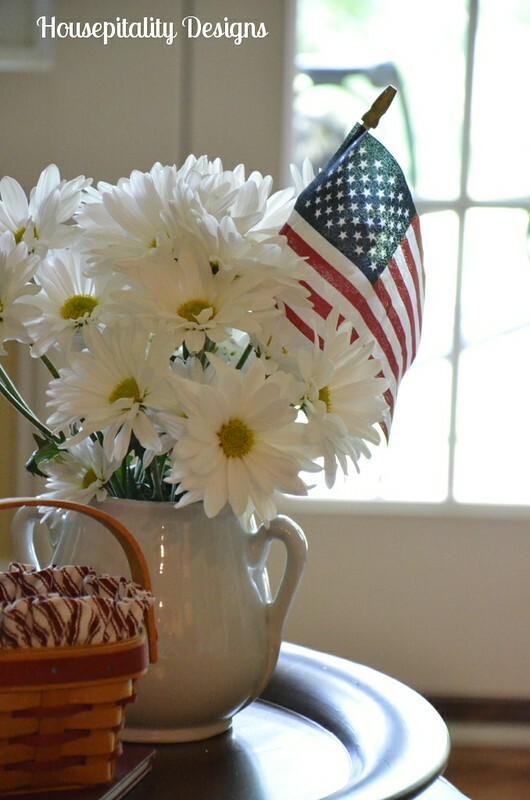 It’s cozy and your Americana touches look great in it. 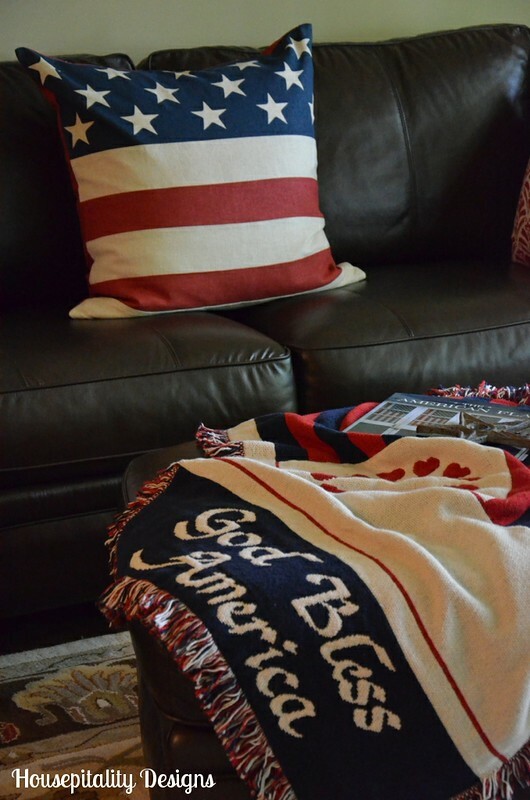 I like that God Bless America throw! I love red so I’m always happy to see it! You’re better off than I as there’s nothing red, white and blue at our house! Linda’s recent post…Getting It Together! Hi Shirley! I can’t believe I just now found your blog! I love it! I’m now following you on bloglovin. 🙂 All your patriotic touches are perfect! I’m going to spend some time now looking back at your past posts. What a wonderful blog!! That seller’s remorse gets us every time, doesn’t it? I have felt it for years now re: the sale of much of the inventory from my store when I retired. I don’t know what the heck I must have been thinking!!! Oh, well…it’s gone now, and there’s nothing we can do about it. But wait…you DID do something!!! You created a beautiful space without it!!!!!!!!!!! Your media room looks great with these touches. It’s just enough to get the feel of the holiday without going overboard. I love the little clock and how you define the 5:00! :-)You’re doggone right about that!!! Ugh, we’ve had so much rain here, too… totally putting a damper on my DIY projects! Love the lamp — I’m sharing a piece on MOnday that I did with Emperor’s Silk. great color! Can’t wait to meet you at Haven!!!! 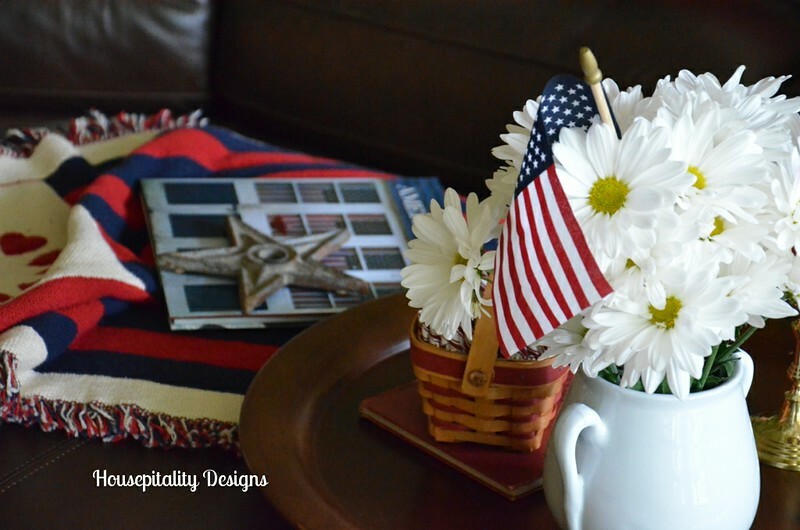 Christina @ Homemade ocean’s recent post…A patriotic pair….